I'm super excited to have survived the last few weeks. Those of you who know me are aware that everything has been in turmoil since 12/12. We've shed a lot of tears of sadness and horror going into the New Year, and Christmas just didn't feel like Christmas knowing what I knew. I took a break from almost everything but family and friends, and found comfort in my community. We've got a long road ahead of us, but we will grow strong, we will find joy, and we will BAKE. Because that, kids, is what you do when you're sad or bored. Just ask my Mom. So, today I'm sharing absolute garbagey comfort food that is wonderful and decadent and so easy. Because sometimes you need Grandma's favorite summer picnic dish to cheer you up. This beauty was made for the family Christmas, because it is a fave among the older generation (the younger are pretty fond of it to, but this trifle always comes with stories of the before times). Obviously, there are ways to make this clean. You can make your own pound cake, and extra vanilla bean paste. You can make the pudding and whip cream from scratch. But today, it's about fast, dirty, and easy. I used this Wilton's recipe for Pound Cake from Cake Mix, because the holidays left the shelves empty of the confection in both the bakery and baking aisle of my favorite grocery store. In general, I've had good luck with Wilton's recipes, so I braved it. I did sub in coconut oil instead of veggie or canola, because I like a little health in my fat. Mix boxed cake mix, water, oil, and pudding thoroughly before adding the eggs. This is because you probably heated that coconut oil and don't want the eggs to cook in the bowl. Beat with electric mixer for 2 minutes until smooth. This is super heavy, so you'll have to lift your motorized whisk attachments now and again to keep it in the bowl rather than crawling up your hand. Grease 2 round cake pans with butter or coconut oil. I actually had the butter on hand so I used that. Pour cake batter equally in both pans, and bake about 30 minutes. Cake will brown on edges and spring back when pushed. When done, cool in pan 10-15 minutes, then flip out on racks to cool completely. Before bed, wrap those babies up in flour sack towels to keep them moist over night. While the cake cooks, prepare cook and serve plain old vanilla pudding according to box and cool. Store overnight in fridge. Pull strawberries from freezer to thaw while you go about your business. You can also nuke those babies for a few minutes and mash them for faster thaw, but you want the juice too. Cut cakes up into squares. 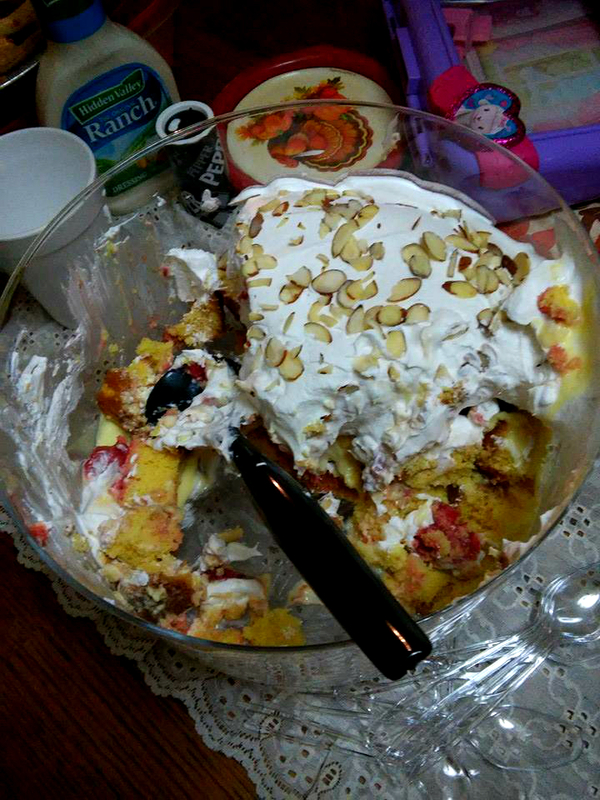 Place one layer of cake in bottom of trifle bowl or a bowl a little deeper than your cake carrier's lid. You can also use the cake carrier lid if you don't mind being ghetto, and have one of those nice flattop ones. On top of cake, pour/scoop half of strawberries and juice. Use a spoon to distribute. I know, it doesn't look like much, but trust me. On top of strawberries, scoop in half the pudding. Same deal. Repeat cake, strawberry, pudding layer. Place in Fridge to chill 2-4 hours. Before serving, cover with cool whip or whipped cream. You can sprinkle with almonds if you like. It can be chilled up to 12 hours before it goes to disaster mush.